This post is a travelguide with the best things to do in Yazd. Yazd was one of my favourite cities in Iran. First of all, I loved the laid back atmosphere and it was the perfect place to take it slow for a couple of days. One of the best things to do in Yazd was simply wandering around the winding lanes of the old town where every time I discovered something new. A hidden mosque, a shrine, a wind tower or a traditional zurkhaneh. Yazd offers plenty of things to do for those that love history and culture. The city is beautiful enough to spend most of your time there, but Yazd is also the perfect gateway to explore Irans stunning desert. Yazd is a true desert city and the desert is never far away. From sandstorms to the extreme heat. Yazd was the first place where the dress code felt too warm for me, even though it was still April. I can only imagine how hot it must be in summer. However Yazd is well adapted to the climate in several ways. Wind towers were made to cool down the houses and the so called ab anbars were to preserve water. The domes of the underground water storages with a wind tower on each side are still a common sight in Yazd. Unfortunately many water storages and wind towers are left abandoned and the question is for how long they will survive before crumbling down. For now, finding them in the small neighbourhoods of the city is one of the fun things to do in Yazd. Despite its remote location in the desert and the harsh climate, Yazd claims to be one of the oldest continously inhabited cities in the world. Whether the claim is true or not it certainly was an important town on the ancient Silk road. Yazd was an essential stop on the trading route from China to Europe. It was here that cultural and political ideas were exchanged between traders of multiple countries. Nowadays it is not traders that come, but foreign tourists keeping the tradition of cultural exchange alive. One of the best thing to do in Yazd is a visit to the blue mosque. During the day the blue tiles are already impressive, but they truly come alive at night when the lights deepen the blue colours. For me, this was the most beautiful place to visit in Yazd and I was lucky my hotel was right next to it so I could visit it multiple times. Each time I noticed different details. Iran’s history is full of things that we hear little about in the west. Did you know for example that the oldest religion comes from Iran. Before Iran adopted Islam, they practised Zoroastrianism. The first monotheistic religion in the world that is believed to have had a huge influence on the development of christianity. The best thing to do in Yazd to learn more about the history of Zoroastrianism is a visit to the towers of silence. Zoroastrians believe the earth is holy and should not be polluted by burying the death. Instead they used sky burial sites where bodies where left for birds to eat. They are no longer in use as such, but are now a popular tourist attraction. Yazd is one of the few places in Iran that still has a small Zoroastrian minority. The towers of silence are now remains of the past, but the fire temple in Yazd is still an active place of worship. The holy fire inside is said to be burning since 470 AD. There is also a small, but interesting museum with explanations about the Zoroastrian faith and customs. It is the best thing to do in Yazd to see the still active Zoroastrian community in practice. One of my favourite things to do in Yazd was simply wandering around in the old town. It is there that you will find the real beauty of Yazd. The narrow streets with the yellow sandstone houses are peaceful and quiet. You might get lost, but it is the kind of place where that doesn’t matter. There are several traditional old houses in the old town of Yazd. Honestly, they were not as impressive as the houses in Kashan and a little bit of a tourist trap. I visited the Khan e Lari and the only interesting thing I saw was a white room with old pictures of smoking ladies. If you did not visit the traditional homes in Kashan it might be worth the entrance fee, otherwise you will not miss much. Chances are, that your traditional hostel is more beautiful. Alexander Prison is busy with tourgroups, but for me this was another tourist trap in the old town. It is not at all sure this building was built by Alexander the Great and there is nothing special to see inside. The courtyard in front of the Alexander prison is a nice place to sit and see the building from outside. It is in the midst of the old town so you will likely pass by anyway. We came across several ab anbars or water reservoirs in Yazd. They are interesting dome structures in which water is stored underground and cooled by wind towers. Some of them are still in use but most of the ones we saw were deserted and used for trash. Also we never found out where the water that used to be stored inside of them was coming from. There is also a water museum near the Amir Chakmakh square with more information about the use of water in this desert city. While walking through town, two men invited us to their woodworkshop. They were making meels for the local zurkhaneh. A traditional gym where men make impressive moves with the meels on upbeat music. We got a free demonstration on how they were used and were then encouraged to try it out ourselves. They were extremely heavy and our efforts were witnessed by much joy and laughter. Later on we passed by a zurkhaneh and were able to have a quick look inside. Unfortunately we weren’t able to see a show, but if you can it certainly is one of the most fun things to do in Yazd. The Amir chakmakh mosque is a beautiful structure on a large square near the old town. Nearby are several fun things to do in Yazd such as a zurkhaneh that is open for visitors and the water museum. Therefore it is well worth the gentle walk from the old town to the Amir Chakmakh square. Another reason why it is worth heading to the Amir Chakmak mosque is because it is the best place in Yazd to have kebabs. My favourite is liver kebab, but here you can also find heart kebab, kidney kebab or kebab of pure sheep fat. If you want to read more about Iran’s food read my post here on the Persian food guide: eating your way through Iran. Kharanaq is an old mud brick village that apparently was once an important resting point on the ancient silk road. The mud brick houses are now abandoned and crumbling down. I honestly tought it was a bit of a tourist trap and was more impressed by the surrounding countryside than by the ruins. Chak chak is a Zoroastrian water temple with a beautiful view on the desert. Zoroastrians come here to pray for the water that drips out of the mountain side. They believe that the daughter of one of the old kings came here to pray to Ahura Mazda, the god of the Zoroastrians. In response the mountain opened up and took her in to protect her. The ever dripping drops of water are believed to be tears of grief in remembrance of the princess. Meybod is another desert town where the modern buildings have mixed with some older ruins such as a castle, several water reservoirs and a pigeon-house. Such houses were built for pigeons to rest in and their droppings were used as a fertilizer. Nain is a small town in the desert halfway between Yazd and Tehran. 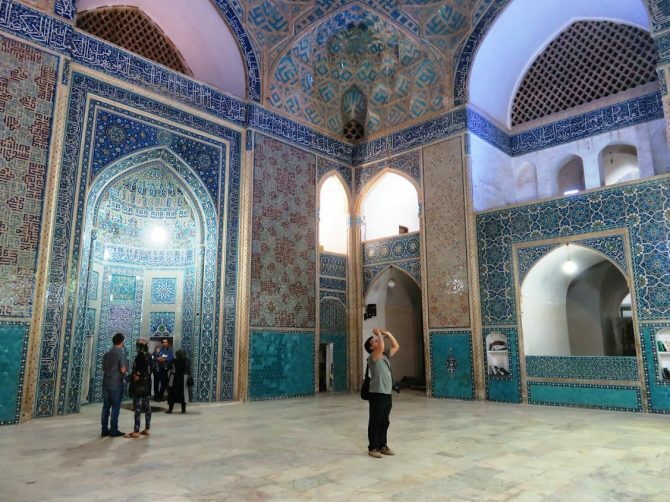 Most tour groups only make a quick stop to see the first and oldest mosque in Iran. Wikitravel convinced me that there is more to this town than the oldest mosque alone and promised me a variety of things to do such as an old castle and a bazaar. Old it was, but the reality were abandoned buildings that were falling apart. The old bazaar had closed down with most merchants moving to the newer parts of town. The mud brick structures were left alone to crumble down. A pity, as this town obviously has a lot of potential if things were maintained. At the other hand, it is very quiet with no other tourists around and this made the old town a great place to shoot pictures. At the oldest mosque I met the author of the travel guide on Wikitravel. He is trying to promote Nain as a tourist destination and is collecting photos of Iran to sell as post cards to the tour groups visiting the mosque. I am not sure Nain will ever be the next tourist destination, but it certainly was an interesting place off the beaten path with friendly people. It was the only place where I saw the water reservoirs still in use. In the new part of town Nain was more lively. A men invited me to his sweets factory to try out the Iranian version of Nougat called Gaz. It was absolutely delicious. It’s a white nougat with pistacio nuts inside. Kharanaq, Meybod & Chak Chak: There is no public transport, but it is easy to hire a taxi to visit all three places in a day. If you want to know more about visiting Iran’s desert, Naomi from Probe around the Globe wrote a very useful post about the best places to see the desert in Iran. Thanks for bringing me back to Iran. It is a very interesting country and I recommend it to everybody to visit. Your post is very informative and useful! This looks amazing! I’ve been seeing a lot of photos and such from Iran lately and I’ve been starting to plan a trip in the back of my mind. I had no idea there were so many things to see in do in Yazd and the architecture looks amazing. What an incredible and detailed guide! I really would love to go to Iran,but it is not possible anymore due to restrictions for US citizens. Some day. 🙂 I love the architecture and the sound of the food! Wow, this is incredible. Thank you so much for writing this! I have a friend who lives in Iran and I would love to visit some day. It looks so beautiful and I love the history and geographic diversity of the country. Great! I really want to visit Iran soon and Yazd is definitely on the list. Your pictures are beautiful. Hi dear lady from the netherlands.How are you doing?Hope you are so happy and good.You have visited the historical place of Taq Bistan in Kermanshah and I’m the boy who I have met you there and showed my photo collection with tourists.I should apreciate you due to you defined me in your cite.Hope to meet you again.